Arrrrgh Signal is ready to go on a treasure hunt! This combo has two of the coolest things we have ever seen, the Signal the Frog® 2" Figure, and the Pirate Torso Kit! You get the complete custom Signal kit including the 2" figure and trackable brick, and the complete custom Torso kit including the treasure chest, pirate flag, hook hand, treasure chest and treasure! 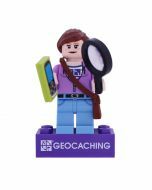 Oh, the adventures that Pirate Signal will see, and the treasure he will discover throughout the geocaching world! Signal Kit includes the Signal 2" Figure, Trackable Brick and lily pad stand. 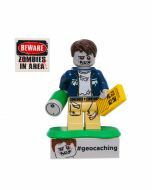 The brick is trackable at Geocaching.com with a unique icon. Torso Kit includes the torso (works on any standard 2" figure), hook hand, pirate flag, pirate chest and treasure. 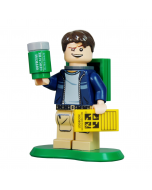 You're reviewing:Pirate Torso kit with Signal the Frog® 2" Figure and Trackable Brick!